Enlogic PDUs are designed to simplify rack power management within a data centre environment. With built-in energy metering, Enlogic intelligent Power Distribution Units provide comprehensive energy measurement data. This can be used to efficiently manage resources, make informed capacity planning decisions, improve uptime, measure Power Usage Effectiveness (PUE) and reduce energy usage within datan centre environments. Enlogic is a global manufacturer and supplier. The company has offices in the UK and Ireland, Germany, USA, Singapore, China, Australia, Netherlands, Nordics, Hong Kong and Malaysia. Enlogic employees hold 16 technology patents relating to the design and use of in rack power distribution. Typical clients range from leading datacentre operators to blue chip companies and public sector organisations. 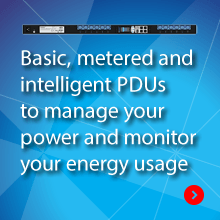 Filtered Basic PDUs – – EN1000 Metered PDU: for real-time metering and network load power monitoring to help avoid overloads, plan capacity and load balancing, and efficient energy usage and optimisation. Metered and Switched PDUs PDU/Outlet Level Outlet Level EN2000 Metered, Outlet Switched PDU: with remote outlet On/Off switching for power-up sequencing, remote power cycling and outlet use management PLUS the features of the EN1000 Series. Advanced Metered PDUs PDU/Outlet Level – EN5000 Outlet Metered PDU: with individual outlet power and energy metering PLUS the features of the EN1000 Series. Intelligent PDUs PDU/Outlet Level Outlet Level EN6000 Outlet Metered, Outlet Switched PDU: offering comprehensive management PLUS the features of both the EN2000 and EN5000 Series. 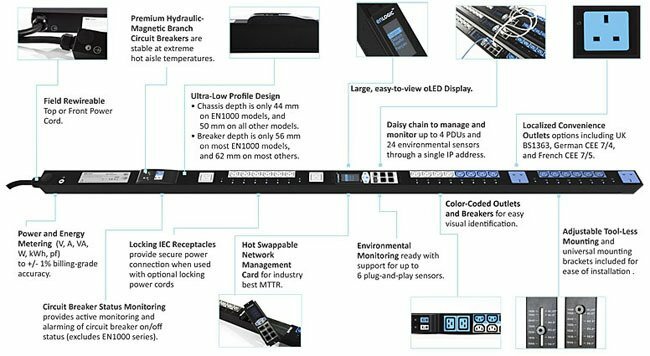 In-line PDUs PDU Level – EZ1000 To add energy metering and EN1000 Series capabilities to existing basic PDUs and stand-alone systems. For more information please click on the individual Enlogic PDUs shown below or contact the Eco Power Projects team to book a FREE site survey or view an online demonstration of the Enlogic DCIM Software package. 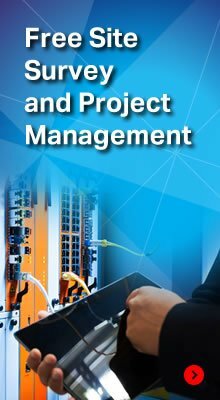 Download the Enlogic PDU Shortform guide.